With 100% of the vote in? Kemp has a AP reported 50.5% of the vote vs 48.6%…. A little after 1:30 a.m. E.T., Abrams took the stage at her election night party to address the crowd. 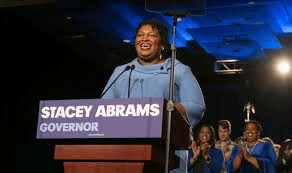 She said that they believed there were outstanding votes in Democratic areas, as well as absentee and provisional ballots left to be accounted for that could deprive Republican Secretary of State Brian Kemp of the 50 percent needed to clinch the election outright. Polls showed Kemp leading Abrams 51 percent to 48 percent with 96 percent of precincts reporting. If the race goes to a runoff, the race would continue for four more weeks and voters would have to return to the polls a final time on Dec. 4. As Secretary of State, Kemp oversees the state’s election. His office is currently being sued by multiple civil rights groups for enforcing policies that suppress minority votes….